Developed by Gust Co. Ltd.
With nineteen mainline games spanning from 1997 to present day, the Atelier series is rich with characters, fantastic audiovisual craftsmanship, and recurring alchemy motifs. Nelke & the Legendary Alchemists ~Ateliers of the New World~ celebrates the series’ twentieth anniversary by juxtaposing characters from every major Atelier game. Being able to experience Atelier’s seven distinct sub-series in one game is a bit surreal. Nelke & the Legendary Alchemists frames the extensive roster with a streamlined take on town-building and roleplaying that players can enjoy regardless of Atelier series familiarity. 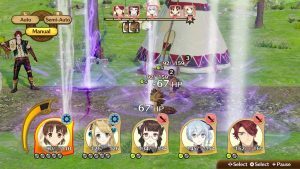 While its structure is a bit simple and straightforward, Nelke & the Legendary Alchemists provides a unique take on the Atelier series with a bevy of character interactions and simulation elements. Much like other Atelier games, Nelke & the Legendary Alchemists features a laid back universe and lively characters. Nelke is an aristocrat sent to supervise the development of Westwald from a sparse village into a thriving metropolis. While not an alchemist, she possesses knowledge about alchemy and has training in a variety of disciplines. She is joined by her maid companion Misty, the villager leader Knoss, and her administrative acquaintance Lotos. Nelke has her own personal reasons for venturing to Westwald as she aspires to uncover the mystery of the Sage Relics alongside new and old friends. Nelke & the Legendary Alchemists is differently named from mainline Atelier games, which reflects how its mechanics and characters are a bit different this time around. Rather than emphasizing synthesis and traditional role-playing mechanics, this game revolves around building a town. The game’s progression consists of a sequence of turns. Each turn has a Weekday town-building phase and a Holiday phase in which Nelke can explore areas and chat with her friends. 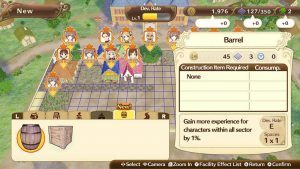 The town-building phase involves creating buildings and assigning characters to automatically create and sell items. These profits can then be used to help construct further buildings, expand usable territory, or bolster exploration. Exploration is automated and consists of random discoveries, materials, and battles. The turn-based battles progress extremely quickly as they simply involve picking battle actions from a five-person party. Players periodically encounter cutscenes that lead to more characters joining the fray. While players encounter large-scale time-based goals, the thresholds are generally rather lenient. Despite its streamlined simple mechanics, the game does provide a rewarding flow once players become accustomed to expanding and populating their town. 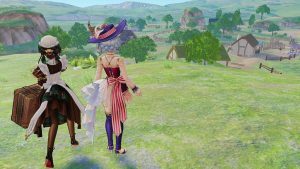 The game is expectedly chock full of references to previous Atelier games, and fans will undoubtedly enjoy the frequent fan service. The recurring blacksmith Hagel and shopkeeper Pamela once again return with their respective music themes. Other familiar songs like Atelier Marie’s workshop theme make a comeback as well, and the arranges are generally executed in a fairly serviceable way. The series is full of references to barrels, and placing a barrel in town amusingly plays a “barrel” voice clip. 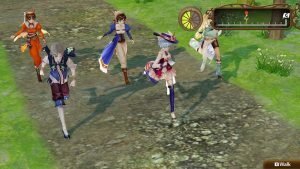 The first ten Atelier games depict characters with sprites, which means that one striking element is that Nelke & the Legendary Alchemists features these characters’ full-fledged 3D debut. Since the first five Atelier games have not been released in the West, this is also the first time that many Western players will even get to experience those games’ respective characters. Being able to experience part of the beginning of the Atelier series is a fascinating treat for series fans. Despite all of its Atelier series callbacks, the game is nonetheless accessible to anyone regardless of series familiarity. The game actually has a lot of tutorials at the beginning, which allows players to understand the flow of exploring and city-building. It gradually introduces Atelier characters and provides just enough context for players to grasp their personalities. Players can also access a handy encyclopedia that clearly shows each character’s origin. Since the game’s scenario essentially involves characters teleporting into a new world, players do not necessarily need to know anyone’s backstory to enjoy the game. Much of the Atelier series’ appeal stems from providing a refined audiovisual experience, and Nelke & the Legendary Alchemists does have a handful of admirable elements. The entire Atelier cast has been redrawn by NOCO, who contributed character designs to the Mysterious subseries. These new character portraits generally capture the expressiveness of the original designs despite the art style difference. The 3D character models are vibrant, and the game is visually pleasing even if the environments are a tad sparse. The Japanese voice track is full of chirpy and fun delivery, and the game lives up to Gust’s legacy of providing laid-back well-built soothing tunes. Nelke & the Legendary Alchemists does have some quirks that dampen the game’s impact. As Atelier fans have come to expect, the majority of cutscenes feature voice acting. However, some mid-dialogue lines occasionally use short generic voice samples, which can be a bit disorienting. For example, Nelke may verbally say “thank you” while the on-screen written line extends for longer. The voice lines also sound a bit compressed overall. Furthermore, this game unfortunately lacks an English dub, which is a bit of a downer considering that many Atelier games feature well-cast English voices. The game’s framerate in general is also a bit jumpy. Another quirk is that the game uses still character portraits during dialogue, which feels a little strange given that the entire Dusk and Mysterious subseries use 3D models. While these quirks do not derail the game, they do lead to a more sparse and inconsistent experience than that of most Atelier titles. Despite its streamlined mechanics, Nelke & the Legendary Alchemists compellingly celebrates the twentieth anniversary of the Atelier franchise. With so many characters and buildings to pick from, the game provides plenty of player agency and decision making despite its use of automated tasks. Being able to take a look at nineteen games’ worth of history under one roof is rather fascinating. 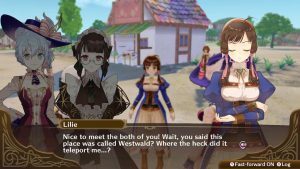 Nelke & the Legendary Alchemists ultimately provides a simple town-building experience full of amusing dialogue and plenty of choices. Copyright ©2019 ConFreaks & Geeks unless otherwise noted.